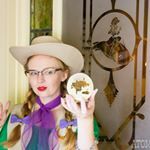 If you follow me on Instagram, then perhaps you know that I was behind the “unofficial theme day” Frontier Day that happened last weekend at Disneyland, a day that celebrates Disneyland’s Frontierland, and of course western wear was encouraged! Dapper Day is perhaps the most well known “unofficial theme day” at Disneyland, but there are countless others, including Tiki Day, we’ve I’ve attended many times and blogged about. These theme days are “unofficial” meaning that they exist without any official approval or involvement from the Disneyland Resort. Disneyland plays no role in planning these days. They are simply organized by people who have a mutual love of Disneyland and something else – dressing dapper, tiki, pin-up, there is even a mermaid day! Typically the days consist of group photos and “ride takeovers” where we all gather to ride an attraction together. As for Frontier Day, well, it wasn’t all me. Last year a girl decided to create a western themed day in the same vein as these other days. She called it Ranger Day, however in speaking with people I learned that many didn’t get why it was called that, even though I did. Shortly after getting the ball rolling on Instagram, the gal behind it (someone I do not know) said she had to step down due to personal reasons, and asked if anyone would like to take over. I found this out as I had many friends texting me and tagging me on her post telling me I should take it over, and I did. I changed the name to Frontier Day. I looked at other theme days as a template and created a day of ride takeovers and even trivia about Frontierland, and western Disney characters. The trivia allowed me to work with some of my favorite companies and artists to offer up unique prizes for attendees. We had somewhere around 70 people show up, which was pretty darn neat! You can learn more about Frontier Day through Facebook and Instagram, and you can learn about other unofficial them days by following the Unofficial Park Days account on Facebook and Instagram, which tries to keep track of all of the different days that happen throughout the year. That string tie is flipping awesome! I love it! !